Please make sure to tell your bus driver, "Thank you!". Our MUSTANG BUS DRIVERS get our students to school and home safely each and every day! Help us shower our bus drivers with thanks and celebrate how great they are on April 23rd. Mrs. Griffin & Mrs. Lindsey, to help and assist each day. Please make sure to tell Mrs. Griffin & Mrs. Lindsey "Thank you!" how great they are on April 23rd. 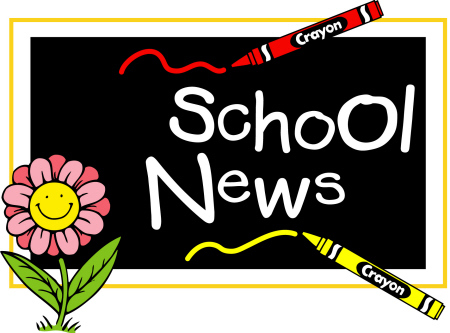 Click on the newsletter link to read up on all of the exciting events happening at Creek this month! The Oklahoma State Department of Education has released the school report cards for the 2017-2018 school year. The new rigorous standards and grading system will be a continual focus for our staff and students. You can review the report cards by following the link below. Press release from the Oklahoma State department of Education. Oklahoma School Report Cards 2017-18 are here. 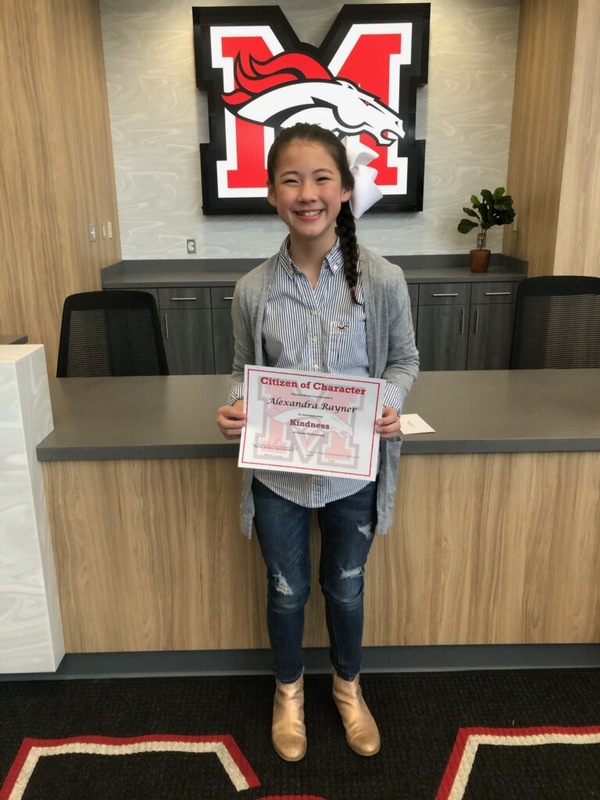 Congratulations to this month's Citizen of Character winner for Kindness: Alexandra Rayner! 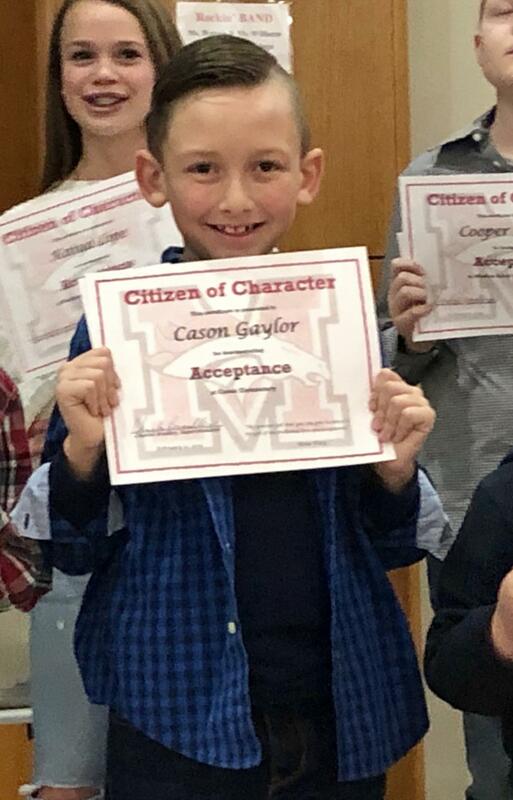 Congratulations to our Citizen of Character: Cason Gaylor! Congratulations to our Teacher of the Year: Mrs. McFarland! We wanted to make you aware that a cooling tower behind Creek Elementary caught fire this evening, Thursday, Feb. 7. The cooling tower is not in use during the winter so school will not be effected. The building is fine and was not involved. Thank you to the fire fighters who responded! We appreciate you! 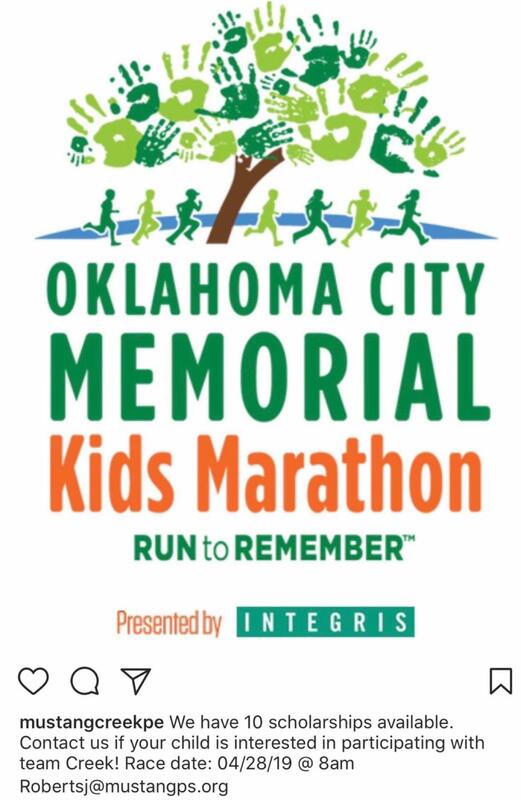 DON’T FORGET - all Kids Marathon School Team Members must be registered by April 1st! If we meet our cap before then, registration will close so register early!!! STUDENTS/PARENTS/TEACHERS SELF REGISTER - Find the Registration link on www.okcmarathon.com. Make sure to type in your school team (MUSTANG CREEK) and select it when prompted for TEAM. Students/parents who self register will pay at the time of registration and sign the online waiver. Please note: Enter your school name when it asks for “team” during the registration process. Start typing your school name, the list will populate, and then you can select it. If you are going to volunteer at Creek, you have to have a background check. Below is the link needed to complete your background check. Remember there is a fee! Thank you for helping keep our students safe! Lil' Snowies snow cone stand will be making stops at Creek throughout the year! Below are the dates that snow cones will be available for purchase. We are excited to kick off a great year! Doors open for drop off at 7:15 a.m. Classes start promptly at 7:40 a.m. Dismissal begins at 2:35 p.m. It gives us great pleasure to welcome you to Mustang Creek...Where Excellence Premieres. Our goal is to provide an excellent educational opportunity and a positive learning environment that prepares our students to become lifelong learners. 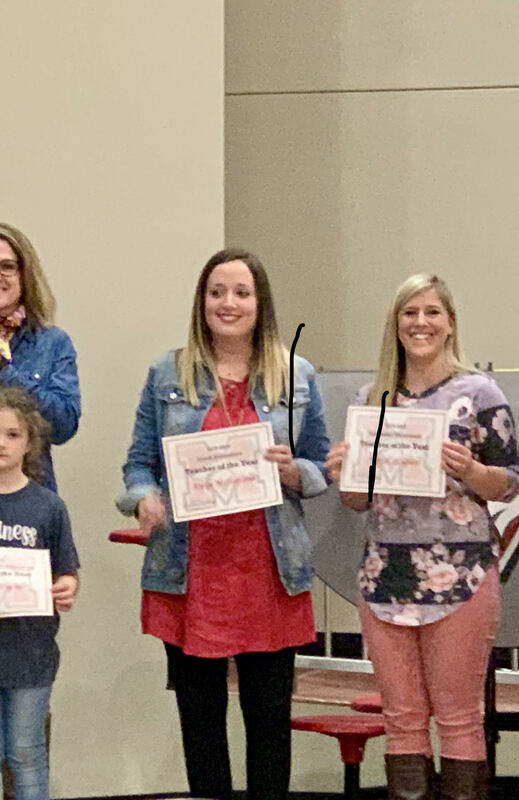 Creek has an exceptional team of creative, professional educators who dedicate a tremendous amount of time and energy providing the best possible education for all our students. Student success is recognized and celebrated in every classroom and also at our weekly school-wide assembly, “Wakin and Shakin”. The district calendar can be found online at www.mustangps.org. Creek drop off procedures are as follows: Only buses and daycare vans will be allowed to drop off students on the west side of the building. All car riders must be dropped off at our car rider loop on the east side of the building. Student drop-off begins each morning at 7:15 am. All cars must turn right on 15th Street after dropping off/picking up students. The tardy bell rings at 7:40 am. At this time, the east doors will be shut and locked Parents MUST accompany their child to the office where they will check in. Students will be counted tardy after 7:40 am. During afternoon dismissal, if a parent forgets his/her tag, he/she will have to go to the office and show ID. Secretaries will give a new car rider tag and then the parent will get back in the car rider line to pick up their child/children. PreK arrival and dismissal will be addressed during Pre K Parent Orientation. If you need to change the way your child is going home, please call the office (405-324-4567) by 1:30 pm to give office staff time to get messages to the teachers. Please display your car rider tag on the driver’s side visor, window or up off the dash. Student’s first and last name should be written in larger, bold print. We are excited to get to know your family, and know that working together as a team will ensure a successful school year! When you shop at Homeland, make sure to link your Homeland One Card to Mustang Creek. Our ID # is 61023 If you have not linked your One Card to Creek yet, just ask the cashier to enter our ID during the transaction and your card will be linked to Creek from that point on. You can also go to homelandstores.com and click on the Dollars for Schools logo, then scroll down to "linking your card" and follow the directions there. This is a GREAT and EASY way to help out Mustang Creek! Mrs. Crews will be posting pictures and videos of music events throughout the year! Miss George will be posting the fantastic art that your artists are creating throughout the year! Coach Roberts & Coach Carter will be posting about physical education activities throughout the year!